Dubai, UAE, April 11, 2019: In an exciting and connected world where moments and memories, from the everyday to the once-in-a-lifetime, are captured and shared instantly, the smartphone has become so much more than just a phone to consumers. That is why the Galaxy S10 series is packed with Samsung’s best camera innovations that enable all consumers to achieve more, experience more and unlock more possibilities every day. The camera on our smartphones has become as much an inseparable part of our lives as the smartphone itself. We're capturing more images than ever before – and the disruptive force of smartphone cameras can no longer be ignored. 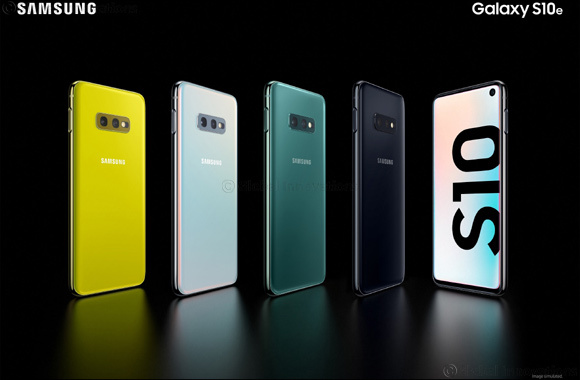 The Galaxy S10 line builds on Samsung’s camera leadership – which includes the company’s game-changing Super Speed Dual Pixel and Dual Aperture technologies – by introducing a slew of exciting intelligence and enhancements that are even more advanced. Together, these innovations offer users all the tools they need to take truly epic shots and videos. Galaxy S10 smartphones boast a professional-grade camera that fits in your pocket. The S10+ has a cutting-edge dual 10MP and 8MP in-display front camera lenses, and a triple rear camera set up with depth and live-focus feature to deliver photographs in Ultra High Definition. Getting the images perfectly sharp is something that all photographers want – however clean, crisp and sharp images can be difficult to achieve. The Galaxy S10 and S10+’s triple rear camera setup also includes a 12MP Telephoto (zoom) lens. For those times when you need to get a little closer to your subject, the Telephoto lens provides two times optical zoom and ten times digital zoom. Each Galaxy S10 comes equipped with a 10MP UHD Dual Pixel front-facing camera that’s perfect for taking high-quality selfies. The Galaxy S10+’s dual front camera setup offers improved megapixels and super-fast autofocus, and includes an RGB depth lens for enhanced quality of bokeh effects. The device’s easy-to-use camera lenses were designed to allow you to capture any shot from any angle. So no matter what you are shooting, you will always have the right lens for the job. The most amazing photos come from the most unexpected situations - it is all about perspective! Whether you are taking a close-up photo or looking to capture the bigger picture, Galaxy S10 smartphones come equipped with camera options to help you capture the moment the way you want. Galaxy S10’s Ultra Wide camera lens covers a width of 123 degrees, which allows you to capture the world as you see it. Perfect for taking epic landscape shots, larger panoramas, or simply fitting the entire family into a photo, the Ultra Wide lens ensures that you are always able to capture the full scene. The new 16MP Ultra Wide rear camera lens offers a field of view that is similar to the human eye – to help you capture as much or more than what you are seeing. Whether we are at a restaurant, a concert, or simply enjoying an evening outside, we are constantly snapping photos in low-light environments. The Galaxy S10’s rear camera automatically switches between f/1.5 and f/2.4 apertures – to adjust to the light for a professional-looking image during the day or at night. Galaxy S10+ also offers Bright Night Shot so you can take professional quality pictures even under extreme low light. For those of you who are new to photography, the S10 series provides you with “Shot Suggestions” from an intelligence bank of 100,000,000 photograph composition. For the social media users, Samsung has partnered with Instagram to directly upload your selfies. The versatility of the camera is just incredible – you can record videos in any scenario with the HDR 10+ technology. Recorded videos are so much smoother with the Galaxy S10, thanks to groundbreaking innovations that ensure the users’ footage looks fantastic. The camera’s Super Steady video-recording feature is the ‘first in the industry’ on a smartphone. It offers users up to three times better video stabilization than conventional technologies. Powered by Video Digital Image Stabilization (VDIS), Super Steady evens out shaky footage, allowing you to record fluid video during your most active moments. So whether you are dancing at a concert or recording a bumpy bike ride, with the Galaxy S10, the content you capture will be sharp and steady. The Galaxy S10’s hardware is complemented by the next-generation Neural Processing Unit (NPU) – a layer of intelligence for all your photos – that streamlines image processing and makes existing smart features better. To ensure that you can take photos whenever you want, Samsung S10+ has a 4,100mAh battery with fast charging capacity so that consumers can take full advantage of the possibilities that the phone offers. There is a lot of beauty around us – and it is now easier than ever to capture the true extent of that beauty in an image. With Galaxy S10’s pro-grade camera, discover even more ways to unleash your creativity, capture, create and share stunning images.